If this isn't an easy repeater each year, it should be. Even when I don't wear makeup, I finish my 'look' with a matter powder. I strongly prefer bareMinerals Mineral Veil because it's available with SPF 25. I don't have a lot of lotions with SPF, and even if I did, every little bit helps, right? While I've linked to the actual bareMinerals site, I believe this can also be purchased at Ulta and Sephora. I just want the plain version (it's also available as a 'tinted' powder). What's your go-to skin-care/makeup item? Of course I now use mainly Posh, but we specialize in pampering, not makeup. I've found over time that I use less makeup when my skin is healthy and pampered, so it's a win. I had a different product down in years past for removing my eye makeup, but I now use Posh's coconut oil. I slather that on my eyes and then gently wash it off in the shower. Works like a charm! 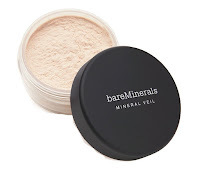 I use bare minerals when I use a powder but usually just Oil of Olay which has an SPF of 25 I think. Love the BFF from Posh.